Retail MarketPlace data measures the retail activity for a specified trade area and provides a direct comparison between retail sales and consumer spending by industry. It also measures the gap between supply and demand. 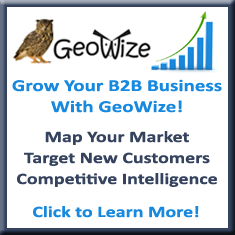 Why Use Retail MarketPlace Data? Retail MarketPlace data helps you understand your market by providing information that helps determine whether a store is attracting customers or if customers are leaving the area to shop. It also provides insight into whether a store’s merchandise mix meets residential customer demand by revealing changes in consumer tastes and preferences by geography. Our Retail MarketPlace data provides a direct comparison between retail sales and consumer spending by industry. To capture a snapshot of an area’s retail market place, the leakage and surplus factor summarizes the relationship between supply (retail sales by business) and demand (consumer spending by household). As the leakage-surplus factor tends toward +100, the market is under leakage, meaning there is less retail activity relative to consumer spending. As the leakage-surplus factor tends toward -100, retail activity increases relative to consumer demand, signifying a surplus. The Retail MarketPlace database captures sales data for any census geography, ring, or polygon and identifies sales data for 31 major industry groups as defined by the North American Industry Classification Systems (NAICS) including:. Who Uses Retail MarketPlace Data? 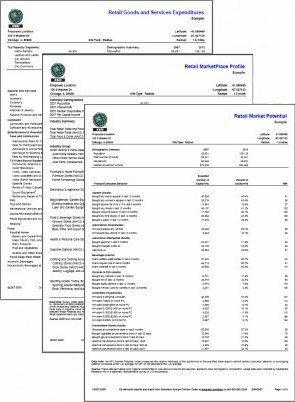 ESRI’s Retail MarketPlace Profile report identifies retail sales and retail potential dollar amounts; the leakage/surplus factor, which measures the gap between supply and demand; and the number of businesses by industry.